For many decades, Gaza has been subjected to extreme situations: three wars in 6 years and under siege for 10 years. This has led to a product and material shortage—especially of construction materials—in the Gaza strip, where construction demand is annually increasing. Simultaneously, ineffective environmental protection policies in industry are having a major environmental impact. One of the major causes of this environmental catastrophe is coal combustion, which results in huge amounts of ash being disposed of in an environmentally-unfriendly way, and Gaza has more than 6 tons/week of ash! GreenCake Blocks are made out of existing raw materials: ash and rubble from the demolished houses in Gaza, instead of importing building materials (sand and aggregate) from outside. People can rebuild their houses from existing raw materials as self-sufficient communities. GreenCake Blocks are high-quality, low-cost, and environmentally friendly bricks. Majd Almashharawi (PS). 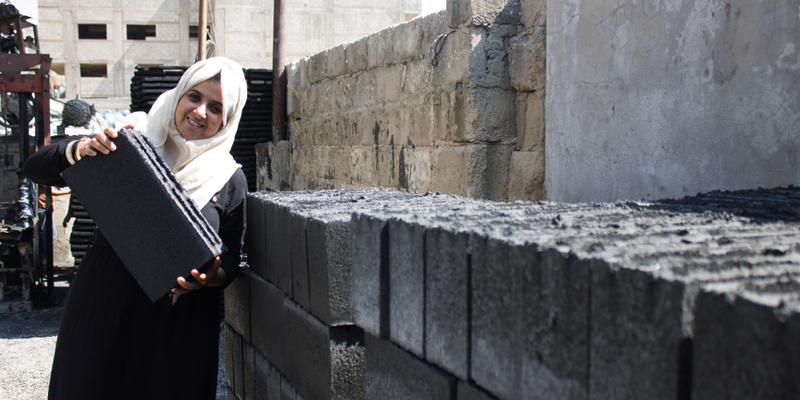 A resident of war-torn Gaza, Majd observed the acute need for access to construction material in order to rebuild damaged buildings and infrastructure. She strove to meet this need by founding GreenCake in 2015—a company that creates environmentally friendly bricks from ash and rubble. She also developed SunBox—an affordable solar device that produces energy—to alleviate the effects of the energy crisis in Gaza, where access to electricity has been severely restricted—sometimes to less than three hours of electricity a day. She received her BSc in Civil Engineering from the Islamic University of Gaza. In 2018 she was selected as one of the most creative people in business.